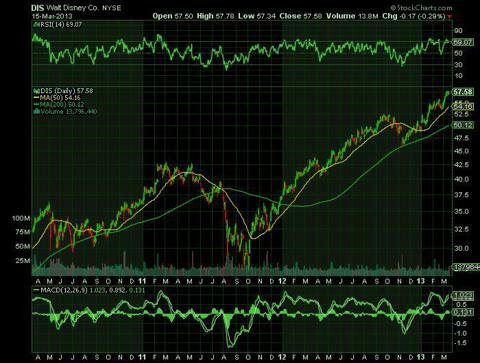 Jedi Mouseketeer: Changes in regulations could impair "Disney" the profitability of the business? Changes in regulations could impair "Disney" the profitability of the business? The Walt Disney Company, the company just never seems to run out of good ideas. It is important for current or potential investors to be aware of the company's risk factors. In addition to the normal risks associated with the economy that all businesses are faced with, Disney is also exposed to various competition in the world of entertainment. The company's television networks compete with other networks that have other programs running simultaneously. Disney needs to maintain its edge on innovation and produce what is appealing to consumers. This risk also applies to the company's movies and theme parks. The company must continue to produce products that meet consumer's tastes. I think that the company has done an excellent job over the years of offering what consumers want, it just needs to continue to do this going forward. Disney has been able to capitalize on stories and themes that have already been in existence and has the ability to bring them to life in a fun, entertaining way. Changes in regulations could impair the profitability of the business. This could include: FCC regulations of Disney's television and radio networks, Federal, state, and foreign privacy data protection laws, safety regulations of theme parks, trade restrictions imposed by foreign countries, and changes in tax laws and currency controls. 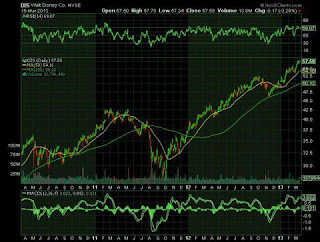 Disney looks fairly valued with a trailing PE ratio of 18.57, a forward PE of 14.84, a PEG of 1.36, and a price to book ratio of 2.53. Currently, the market is trading with a trailing PE ratio of 14, which is slightly below its historical average of 15. Disney has a positive earnings revision for fiscal 2013 and 2014. Earnings per share estimates for FY 2013 were upgraded to $3.45, up from $3.41 3 months ago. Earnings per share for FY 2014 were upgraded to $3.84, up from $3.88 3 months ago. The company is expected to grow earnings annually at 12.28% for the next five years. In the past five years, Disney achieved annual earnings growth of 9.67%. If the company is able to achieve its earnings growth expectations, a $10,000 investment is Disney today should be worth between $18,000 and $19,000 in five years if dividends are reinvested. The company has a great track record of producing quality movies, network programming, entertaining cruises, and fun-filled theme parks with mass appeal. By carrying on the tradition created by Walt Disney himself, the Disney brand and all of its parts are likely to remain 'great and powerful'.